Hi everyone! Valerie here this week. When Carol asked me if I could write the Sunday Edition post this week, little did she know I was going to use it for self-promo! Okay, not just promo for me, but for six Inspy Romance authors. That makes it okay, right? 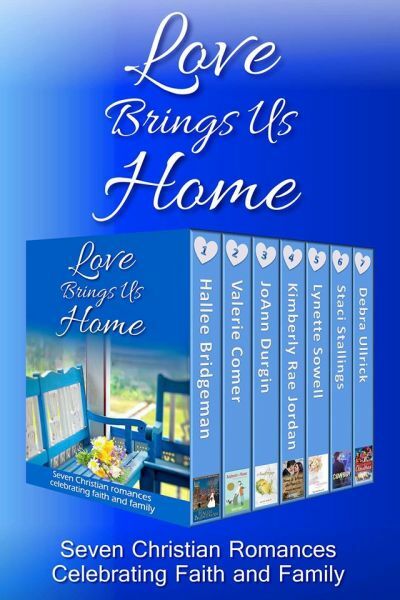 I’d like to introduce a contemporary romance box set called Love Brings Us Home, which is on pre-order right now for only 99 cents. This box set is a time-limited offer and one you won’t want to miss. Winners of Kinsale Kisses from Elizabeth Maddrey’s post are: imabrassy1 and juliadp2014. The winner of Marrying Kate from Kimberly Raw Jordan’s post is Andrea Cox. Ginger blogged on Saying I Love You on Monday. Kimberly talked about A Love Affair with Romance on Tuesday. Beth gave Cathy West the stage on Wednesday: Guest Post: Award-Winning Author Cathy West. Lorraine talked about Hero Stuff on Friday. Congrats to Lynette Sowell and company! A Great Teton Sleigh Ride is #12 on the EPCA Oct bestseller list! Congrats to Lorraine Beatty and company! Christmas Comes to Bethlehem, Maine is #15 on the EPCA Oct bestseller list!